Millennials’ involvement in church has been one motivating factor in my spiritual journeys research. When I came across an article titled “Religion as Bridging or Bonding Social Capital: Race, Religion and Cross-racial Interaction for College Students” my interest was piqued. The title suggests that college students and their social interactions can benefit from an understanding of religious beliefs. The article asserts that colleges have a responsibility to promote cross-racial interaction and cultivate an environment in which students from diverse backgrounds meaningfully engage with each other. The authors of the study recognize that structural, organizational, and social factors, i.e. religious affiliation, influence student interaction. Religion, interestingly, seems to be the most segregated aspect of American daily life both on and off campuses; Parks and Bowman cite research, particularly that of Bryant, that implies participation in religious communities has a negative relationship with diversity-related behaviors. Such organizations instead promote bonding of likeness. (Park & Bowman, 2015). Consequently, the goal of this quantitative survey study is to examine whether religious observance, religious world view, and participation in religious student organizations affects cross-racial interaction (CRI). This is significant because college tends to be first opportunity for young adults to interact with and make connections between different racial/ethnic groups. Participation in campus religious groups is associated with lower CRI. Students attending a religious group with a majority of the same race would have lower CRI than groups with a more diverse majority. Students who identify as Muslim, Buddhist, Jewish, or Hindu (religious minorities) would have higher CRI than the Protestant reference group. Students with higher religiosity will have lower CRI. There will be a negative relationship between religious activity and white students (Park and Bowman, 2015). The study found that students belonging to religious minorities all had higher CRIs than Protestants. The authors were surprised to find that significant effects between religious group participation and CRI were lacking. Instead, religion seems to make it easier for students to create bridges between students of different races (Park and Bowman, 2015). Because this study seemed to reflect a positive conclusion in regard to millennials and religiosity, I chose to investigate more of Alyssa Bryant’s study, a study Park and Bowman seemed to use as a counterargument and jumping off point for their study. I found “The Impact of Campus Context, College Encounters, and Religious/Spiritual Struggle on Ecumenical Worldview Development” through the university online database. This quantitative study of 14,274 college students analyzes how students develop an ecumenical worldview.The study used a four page survey to examine the extent to which religious/spiritual struggles mediate the relationship between campus contexts/college encounters and worldview. The findings illustrate that college experiences bring students into contact with religion, spirituality, and diversity in classroom and co-curricular settings. More challenging experiences tend to provoke religious and spiritual struggles, and while the struggles “stimulate acceptance of, interest in, and understanding of others…,” the experiences may cause lower levels of psychological well-being, physical health, and self-esteem (Bryant, 2011). This qualitative research study expands upon a 2008 quantitative research study that identifies correlative factors of students’ spiritual struggles. This follow-up study used interviews, transcriptions, and journal reflections to define and classify the spiritual struggles of college students. 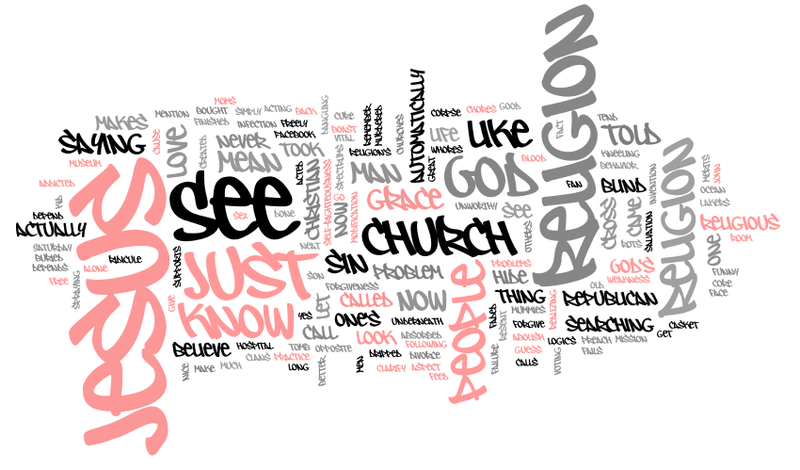 The study found that spiritual struggles of college students can be summarized in one word: CONTRAST. 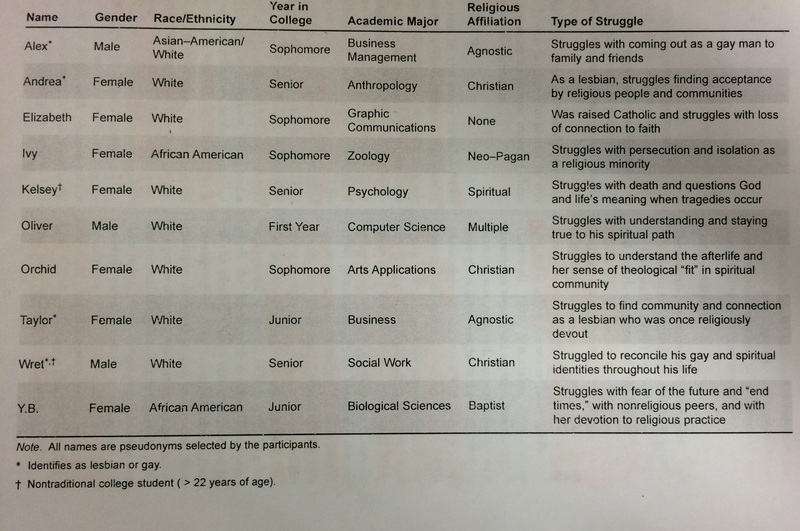 Bryant, Walker, and Luzader write, “At their core, spiritual struggles were steeped in the conflicting, contradictory, and paradoxical aspects of life….Spiritual struggles revolved around deeply felt dualities in the most fundamental aspects of the human experience.” As the chart from page 60 of the study reveals, religious struggles of young twentysomethings arise out of questions sparked by new experiences or new interpretations of previous experiences. Millennials may be confused about church, but had I read the sources from bottom to top, instead of top to bottom, I would have recognized that positive experiences arise for this young generation out of religious questioning and exploration. Hope and faith may not be as lost as I had assumed they were. Faith, instead, is a starting point for relationships and connections as long as this generation stops being afraid to learn about it and discuss it. Bryant, Alyssa N. “The Impact of Campus Context, College Encounters, and Religious/Spiritual Struggle on Ecumenical Worldview Development.” Research in Higher Education 52.5 (2011): 441–459. Web. 4 Apr. 2015. Park, Julie J., and Nicholas A. Bowman. “Religion as Bridging or Bonding Social Capital Race, Religion, and Cross-Racial Interaction for College Students.” Sociology of Education 88.1 (2015): 20–37. Web. 5 Mar. 2015. Rockenbach, Alyssa Bryant, Coretta Roseboro Walker, and Jordan Luzader. “A Phenomenological Analysis of College Students’ Spiritual Struggles.” 53.1 (2012): 55–75. Web. 4 Apr. 2015. I opened the doors to The Treehouse in Audubon, New Jersey for the second time on Friday, March 27. I was scheduled to interview the owner, Randy Van Osten, who is currently a student at Palmer Theological Seminary, pursuing a Masters in Divinity. He is also an associate pastor at Oaklyn Baptist Church in Oaklyn, New Jersey. The interview was scheduled for 4:30, and it was only 4 pm, so I perused the menu of coffees, teas, and bakery items, many of which are fair trade and/or vegan. I settled on a cup of The Republic of Tea’s Strawberry Vanilla tea being that I have given up coffee in honor of Lent. I took the steaming cup back to a table by the front window and unloaded some items from my overloaded shoulder bag–a computer, a notebook, my field notes, and a pen. As I waited for my tea to cool, I scanned the room. In a Facebook message prior to our meeting, Randy had told me the family opened the cafe as a space where customers could feel God’s love and presences, and I wanted to see if that translated in my opinion. I was drawn to a sign by the coffee stand and supplies, a sign that read “Mugs, Not Drugs.” I chuckled at the positive play on words. The owners definitely have a sense of humor. Additionally, the space was warm as the three baristas were singing a song together as they swept and wiped down the counters in preparation for the music event that would take place in the space later that night. I felt at home and settled in. I must have felt more settled in than I looked because at about 4:30, I was surprised by a voice behind me. “Lauren?” the voice said. “Hi, I’m Randy. Did you need another minute before we get started?” I looked up and then quickly grabbed the books I had strewn on the chair across from me. “Not at all,” I replied. “Please. Sit. It’s really a pleasure to me you.” I am surprised to see the figure matching the voice is wearing shorts, r sandals, a Palmer Theological Seminary t-shirt. He also has a piercing in his left eyebrow and long hair tied back with a bandanna. I feel like I have nearly forgotten that pastors can be regular people, too. 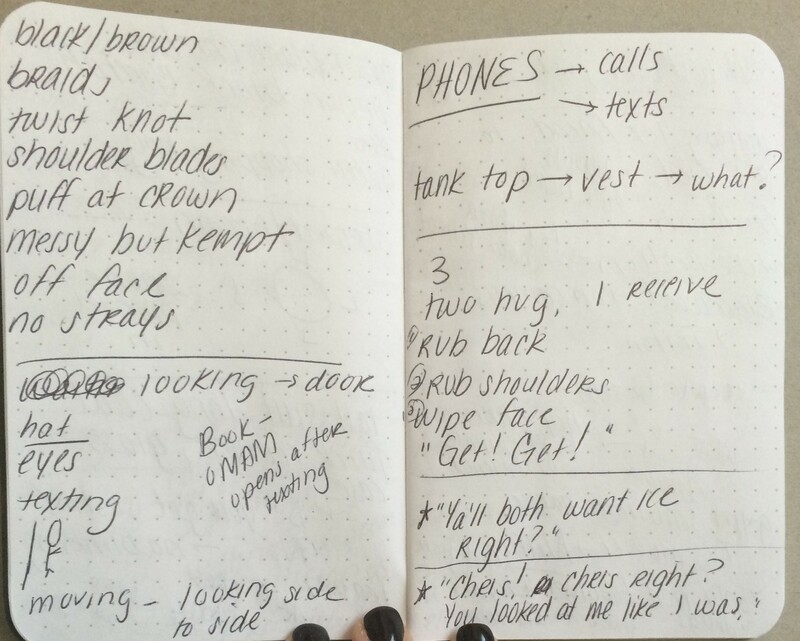 I opened my field notes book atop an outline I had made, and that’s when I began. I introduced myself and summarized my research, explaining my interest in spiritual journeys, particularly the journeys of millennials or those in their late teens and 20’s. At that moment, I could have thrown my outline into the wind because I only referred to it one time in the remaining hour of our interview. Our interview, thanks to my introduction, opened with a discussion about millenials in church, as this is also something Randy is researching at seminary. According to his findings, this age group seems to have an aversion to church, about 33% of this group argues this aversion is predicated by the aversion to the formal structure of services. They also want to be able to make a difference, and the church doesn’t really give them that opportunity. Many churches today operate on the system of the 3 B’s: butts, buildings, and budgets. They aren’t as much about the people as potential members would hope. Serving as a youth pastor for the last six years, this is something Randy is working to combat. His responsibilities include teaching and fostering socialization among the younger members of the parish. He mentions that the youth group, about 35 to 40 6th graders through 12th graders, at his church “likes to have fun” when they meet from 5:45 to 7:45 on Sunday nights. In addition to youth group, Randy has worked to develop a contemporary service, the second service at his church on Sundays that targets an audience of mainly 30-to-40-something members with kids and families. This service includes a worship band, led by Randy’s wife, Theresa, that sings original songs and worship tunes from Chris Tomlin, Matt Redman, and Hillsong United. The service also features a more interactive sermon with video clips and reenactments to keep churchgoers more engaged and interested. He notes that in 20 minutes time, only 10% of the church, the audible learners, would be able to remember a purely spoken sermon. Most people need a more experiential learning enviornment. Randy acknowledges that this contemporary service may not be enough to draw millenials back to the church, suggesting that we “don’t do church the way it’s supposed to be done.” Many church goers hang up their faith when they leave, simply going through cultural motions. Church should really include building a sense of community among believers, a community in which they could share meals and share life. They could read more of the Bible at home independently and discuss. They could go out and do things that serve the town. Randy stated, “If churches want to be seen, they need to go out and love on their community. Love is appealing.” This is why he takes the youth group out on one to two service opportunities a month, including visits at the Ronald McDonald House and Urban Promise Academy in Camden, New Jersey. On a personal level, Randy has been actively involved in church life from the time he was a small child. His father worked for the church, and Randy was in Bell Choir, Youth Choir, and Teen Choir. He also attended Sunday School, church, and youth group once a week from the time he was in Kindergarten through the time he was a senior in high school. Astonishingly, he received a calling to be a pastor at the young age of 13 as he listened to a family he was friends with speak at Camp Lebanon with his youth group. They had returned from four years of missionary work, and Randy explained that he felt God was speaking directly to his heart through this family. He felt that God was telling him he needed to be involved and be a leader. From that point, he never questioned his faith, though Randy admits to leading a double life at some points, particularly during college in which he was torn between God’s ways and the temptations of the ways of the world. He attended a Christian college, but there was still peer pressure in this environment, a statement also made by Jefferon Bethke in his book Jesus>Religion. Randy, however, acknowledges the importance of those experiences because he feels he can relate to people more and serve them better. To maintain his faith now, outside of church, Randy prays, reads the Bible, and the Book of Common Prayer of Ordinary Radicals regularly. He also does a devotional one to two times per week with his two young sons and with his wife, a practice that involves scripture reading and prayer. He used to play music, but between school and running his shop, he simply doesn’t have time time anymore. I was still interested in what Randy meant when he wanted the shop to be a place with the presence of God’s love, so this is the moment of the interview where I returned to my outline and asked what he meant by this. The answer I received was awesome and in-depth, spanning nearly four pages of my field notes book. He began by explaining that he wanted the interactions between the staff and customers to be likened to that of family and embody a familial atmosphere. Randy explained that God can move any way he wants in the space. It could mean someone just enjoys themselves to someone learning about faith in one of the many Bible study or church initiate groups that meet there weekly or bi-weekly. With the recent news controversy about the Religious Freedom Act now effective in Indiana would have any bearing over the shop’s customers or target clientele, but Randy just laughed briefly and replied, “Jesus doesn’t discriminate. Not serving someone is crazy.” He explained that The Treehouse has suffered a bit from the stigma that might surround a Christian-owned business when they were located in Collingswood as opposed to Audubon. They were believed to be an anti-gay business, though this was never true, and were rivaled by another coffee shop in town owned by a gay couple. About a year ago, a customer entered the shop with his daughter. He said she had been invited to a birthday party there and asked if he would be welcome in the shop, as he was gay. Randy said his wife comforted the man and rid him of any doubt that his attendance would be a problem. As Randy retells the story, the man cried tears of love and acceptance. Furthermore, there have been small services and weddings for gay couples at The Treehouse. The rumors, which followed them briefly on the Audubon forum, have been annoying to Randy, but overall, they don’t seem to have affected his business. I was so nervous going into this interview that I over-prepared and had more than 15 pre-written questions, categorized by topics of interest in my research. I arrived so early, thinking I was going to be late. I was worried I was going to be disjointed and jumbled, jumping topic to topic to make sure I thoroughly covered Looking back, none of those nerves were necessary. The interview was comfortable and conversational, in addition to being informative. It turned out that simply sharing the scope of my research and interest was enough to give my interviewee guidance in terms of topics to ponder and discuss. I am glad that I practically through my questions away and didn’t read from them. I am glad, though, that I prepared them, because they did give me a mental checklist to ensure a thorough and complete discussion. Going forward from my interview with Randy, who has so graciously answered to meet again if necessary to answer additional questions, I might inquire about some of the church groups that meet at The Treehouse and see if I can get in touch with any of their leaders. In addition to new potential interview subjects, this could lead to a looking or outing, if I am able to attend one of the group’s meetings at the cafe. I would also like to do a bit of scholarly research on statistics about millenials in church to compare to the figures and information Randy supplied and provide additional insight to his comments. It must be a very broad topic if it is something he can cover in his masters research. I think one of my greatest successes was my use of “on-the-fly” questioning techniques from InterViews by Brinkmann and Kvale. In my introduction, I started with introductory questions, asking Randy to expand upon things he stated. Then, as his answers expanded, I asked follow up questions and pausing after his responses to see if he would share more. I asked a few specifying questions, such as those about his services, youth group practices, and personal practices. 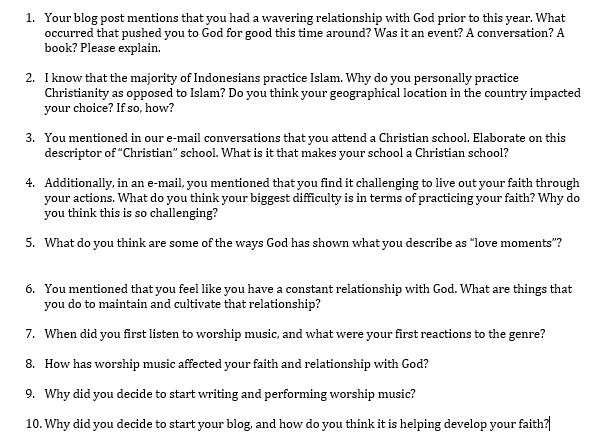 Finally, I ended with direct questions, specifically the question about being a Christian business owner (160-2). This varied use of questioning enabled the interview to span the scope of nearly all of my research questions without becoming dull or routine. Also, being different religions, we got into some cross-culture discussion and comparison, which was interesting and engaging, adding a secondary dynamic to the conversation. I was glad I had done some research on things like worship bands, which helped me understand what he was talking about a little bit more. I almost wish, though, that I had stopped trying to connect my experiences as much as I did. I feel like he might have said more if I hadn’t spent as much time trying to relate with a personal experience to many of his comments. A bit of this enhanced the interview, but I worried I was doing too much. All in all, I really enjoyed the experience, and I’m looking forward to additional interviews I will conduct. I will be interviewing Randy from Southern New Jersey on Friday, March 27 at his coffee shop, The Treehouse, in Audubon. Our third week of class this semester was canceled, but Elaine, Kristen, and I used the time to complete some work ahead of time for class. We met at The Treehouse to enjoy the coffee and the ambiance while we worked. About an hour in to our meeting, a group had formed in the space behind us, and they were watching a video via a large projector screen. We halted our conversation for a few minutes to see if we could figure out what the video the group was watching was about, and we begin to hear religious dialogue. That’s when Elaine, a frequent customer at the shop, had a mini-epiphany. She said that she thought they were a group from a seminary school, and that she thinks they met there weekly. She also exclaimed–she couldn’t believe she had forgotten–that the owner of the shop was a youth pastor at his church and she believed he was still studying at seminary school. I got in touch with Randy, the owner, through Facebook, and after hearing about his experiences, I knew he would be a perfect interviewee. Around the time Randy was 13, he said that he felt God calling him to become to serve Him by working as a pastor. Eight years ago, he attended seminary for one year, and there he met the pastor of Oaklyn Baptist. Randy worked with this pastor as a youth pastor for seven years and was named Associate pastor last summer. He shared that he and his wife, Tina, opened The Treehouse so that there would be a place people could feel God’s love and peace without it being shoved down their throat. They seem to enjoy running the small but warm, welcoming, and family-oriented business. In my research proposal, I mentioned that I had questions about millenials and their church going habits.This is something I hope Randy can shine a bit of light on, as he had been raised in a deeply faithful family and spent three to four nights a week at church in his youth. I’d be interested to see what it was that kept him so actively engaged in the church community. Adding to this topic, I would like to know more about what it was like to receive a calling from God about a path for one’s life, especially at such a young age. I wonder if it would be something obvious or subtle; after all, I’ve heard the phrase “a calling” many times, but I don’t have a clear picture of what that might mean. As a student, the idea of schooling in preparation for becoming a minister is fascinating to me. I plan to ask Randy about the classes and lessons he had while at seminary. It might be interesting to see how it compares to a secular college experience, particularly in terms of practicality and applicability. I know teaching school was highly theoretical and not as practical as a teacher candidate might hope. I’m curious to see if this is a transferrable phenomenon. Because he is a youth pastor, I’d also like to hear some of the ways he adapts messages to help engage and reach a younger audience. I wonder if this would include events outside of the weekly church service. Finally, I would like to see if he can take me through The Treehouse and share some of the ways he feels the elements of the business reflect God’s love. I will be preparing an outline based on the topics featured in the section above, and each item in the outline will have a list of potential questions to ask. The outline will have focus, which Brinkmann and Kvale mention as a major characteristic of a qualitative interview in InterViews: Learning the Craft of Qualitative Research Interviewing. 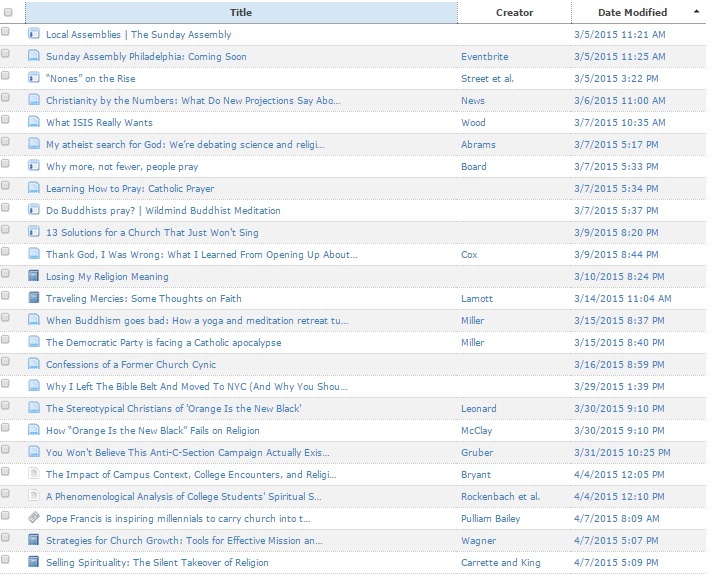 The topics above focus on youth in church, which is a topic in which I have been extremely interested since the start of this research project. This will keep the interview from being too scripted but also too nondirective (34). I believe it will prompt my interviewee to share what he finds most important, and, as he is an expert in this area of the field, I am excited by the prospect of new information he might share with me. I have already explained the purpose of the interview to Randy, as I included the details in my original introduction, but I don’t necessarily want to get to The Tree House tomorrow and start asking questions. In InterViews, Brinkmann and Kvale suggest that an interviewer can engage in a funnel-shaped interview, an interview that features a roundabout approach with indirect questions until the purpose is revealed later in the interview (156-7). I would like to try and start a general, more roundabout conversation with Randy before I jump into the questions, even though he already knows the purpose of the interview, because I want to work to establish a rapport of comfort and interest. This way, the interviewee will have a grasp of me, the interviewer, so that he can feel comfortable to talk freely and expose his experiences. Brinkmann and Kvale recommend this in InterViews (154), and they suggest that this can be established by showing interest, understanding, and respect for what the interviewee is saying. I am a stranger, and I know that I would be nervous if a stranger were asking me personal questions about my religious beliefs. Am I nervous? Extremely. This is the first interview I have had to conduct since I wrote for The Whit during my freshman year of Rowan. I used to rehearse interviews and phone calls that I would have to make and my palms would sweat through the process. Knowing that I’m going into this with a plan, but a plan that is not set in stone, is nervous, but I know that I am taking a risk to develop my interviewing skills. I will be interviewing Steven from Jakarta, Indonesia, through e-mail beginning Friday, March 27. I met Steven through WordPress about three weeks ago. He commented on the blog post I wrote about Jefferson Bethke’s slam poem “Why I Hate Religion, but Love Jesus.” His comment focused on how Christians develop relationships with God, and it was the first comment I’d received from a reader outside of class. This piqued my interest, so I immediately went to his blog and started reading. Steven’s blog is subtitled “A vessel of honorable use,” which suggested to me that he was going to be focusing on serving God. I wondered how he hoped to do that, so I scrolled back through his posts and found his introductory post, in which he described how he wanted to try blogging to work through his revelations about God. He wrote that he had always done this in song form, and, because he enjoys writing, he felt he was ready and willing to try something new. Steven’s blog has grown tremendously in the last few weeks. He has gone from writing brief posts to lengthy reflections on life and scripture. The development he shows in his writing suggests that his blogging is really having a positive effect on his spirituality, which is one topic I would like to focus on when I interview him. Brinkmann and Kvale in Interviews: Learning the Craft of Qualitative Research Interviewing suggest focusing the interview around particular themes rather than directive questions so that the interviewee can bring up what he or she finds important (34). I think this is a theme that would lend itself to a discussion about many significant details. When I first reached out to Steven via e-mail, I was surprised to learn that he is only 17 years old and from a country that is predominantly Muslim. I feel as though it is rare to see someone so young so in touch with their faith and would also like to discover more about how a young man developed such a strong sense of self and faith this early in his life. Furthermore, I’d like to know a little bit about what it is like being a Christian in a predominantly Islamic nation. I am wondering if it develops a stronger sense of community among Christian believers or if it creates challenges in terms of worship. From what I read in his posts, it appears that worship music plays a significant role in his closeness with God. Therefore, this will also be something I hope to inquire more about through our interview process. I wrote two blog posts about worship music and Christian rock to develop a the background knowledge that would facilitate question development. Although Brinkmann and Kvale suggest that interviewers practice “deliberate naivete” or an openness to new and unexpected phenomena as opposed to “readymade categories and schemes of interpretation,” (33) I wanted to have an understanding of the topic because I will have to form prepared questions and categories for analysis as I am not conducting an in-person, spoken interview. I had originally hoped that Steven and I would be able to conduct an interview through Skype or G-chat because InterViews asserts that a research interview is a semistructured meeting that focuses on the subject’s experience of a theme (29). An online interview through a video-conferencing platform would have afforded the opportunity for conversation to flow naturally around several different topics. However, because of technological differences and a significant time zone difference, we will conduct our interview via e-mail. I do think, though, that because Steven is becoming an avid blogger about his faith that having him write his answers to e-mail questions might provide significant depth of knowledge and insight. The only thing I will miss through e-mail is the embodied communiation that would come forth in an in-person interview. In InterViews, Brinkmann and Kvale write that “…bodies are never neutral but carry all their signs of gender, race, class, and so on…how people sit and comport themselves, how they smell and move, and how they are dressed…This may or may not affect the interaction…” (115) As a writer myself, I hope, though, that punctuation, writing voice, and style of the responses I’ll receive convey similar information. I plan on starting with ten questions, as pictured in the screenshot below. After I receive responses, I may feel compelled to ask more, and I am hoping that I will have the opportunity to send additional, follow-up questions via e-mail at that time. Well, that’s it. Spring break has come to a close. I don’t know if I would call it a break, exactly, as I was very busy with tasks for both work and class. I was also busy working to network and make contacts. If anyone asked me a year ago if I thought I’d be networking, and handing out a business card, I would have laughed at them for hours on end. That’s exactly what I did, though, this past week. I reached out to others, and I worked to steady my quaking nerves. 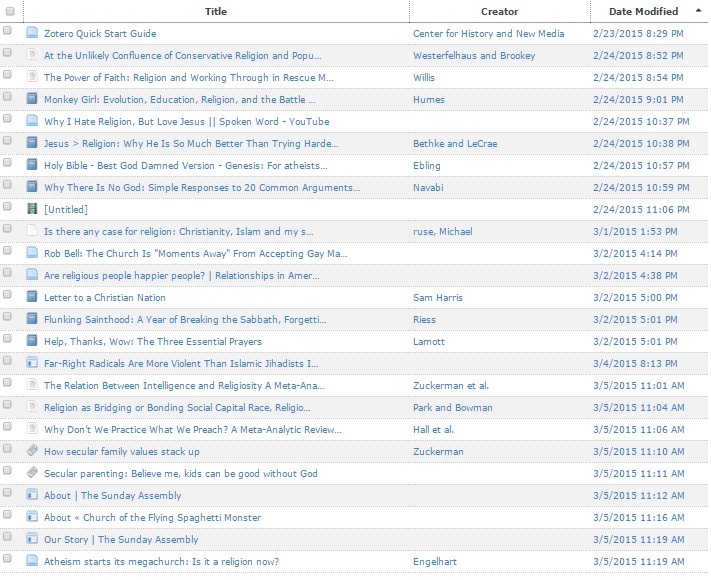 Over the last month, I have been working through both digital resources and print resources related to topics in religion and spiritual journeys. Now that I have begun to develop an understanding of some key aspects of faith, I am ready to begin conducting interviews and researching with experts and participants in the field. The image below is a tentative schedule for interviews, both in-person and online, as well as lookings during which I hope to “walk” through church services and the physical spaces of churches with experts in the field. I have a very busy schedule the next two weeks, but I am excited to get started with the research. In preparation for these interviews, I am making lists of topics I would like to cover. If you are interested in reading more about the preparation process, check back on the blog on each of the “Pre-Interview” dates in the above table. This will explain what I hope to accomplish during each interview and how I plan to approach it. As I’m sure my readers are all well aware of by now, I have been posting research practice to be transparent about my process for my current project. On March 3, my Research Methods for Writers class met in our campus student center to practice recording ethnographic field notes. Post 1 focused on translating jottings into complete sentences, and post 2 focused on creating narrative scenes from my field notes. The final task for this practice assignment was to compose a short, descriptive piece about a student’s hair and a reflection about my experiences as an observer. Not many 20-something women can boast a flawless hairstyle in the midst of a two-day rain and sleet storm. Most have sloppy top knots and twisted messy buns that droop with dampness to this side or that. Not this girl, though. Sleet, rain, and impending snow be damned. Her hair had style, and she was pulling. it. off. The braids pulled all of her locks back from her hairline tightly, framing her face elegantly. Not one hair was out of place. Not one hair curled. Not one hair frizzed. Not one hair fell in front of her eyes. Her hair knew who was boss: she was. Her style reflected complete control. Her style also reflected fearlessness.Her jacket’s hood was tucked beneath her backpack, suggesting she hadn’t worn it during her trek the student center and probably wouldn’t put it up before leaving. Absent from her hands was an umbrella. She, and her braids, remained un-phased by the weather, much to envy of those of us with damp, frizzing, and waving tresses. At the start of the assignment, I found myself hesitant and confused, unsure if I had a thorough understanding of the expected tasks. 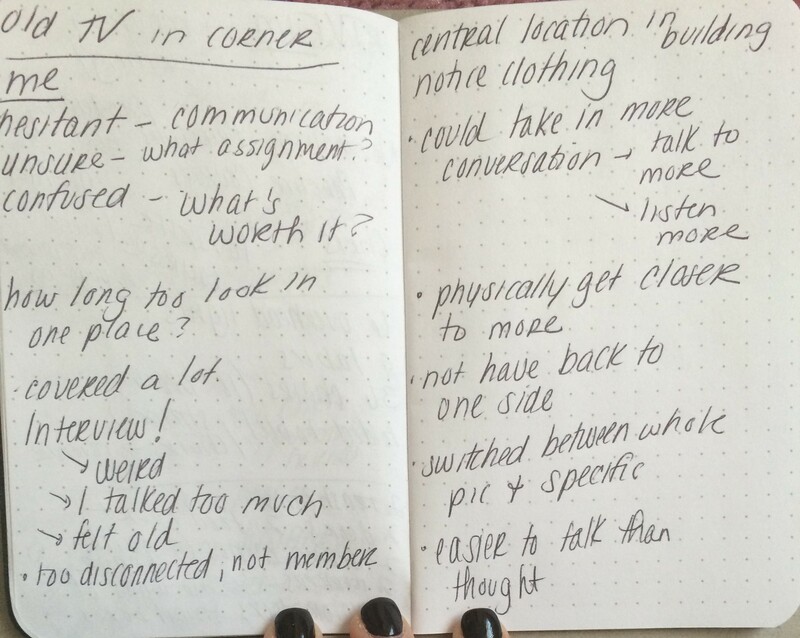 Though I had spent 20 minutes discussing with my group what aspects of observations could be deemed “field note worthy,” I continued to ask myself, What’s worth it? What will be interesting enough to put down on paper? What’s interesting enough that someone would want to read about it? How long should I sit in one place? I realized, after completing about 40 minutes worth of observations, that I was fortunate to have selected a central location that saw many people. I was able to take in a great deal, including setting, clothing, actions, and conversation. My notes spanned many topics and many “characters,” which helped me write a few interesting posts and scenes. I was impressed with the quality of these products. I also conducted a brief interview during my observation, something I was terrified to do at the start of class. It was weird at first, but after a minute or two, especially when I stopped focusing on taking notes while speaking, the “interview” felt more like a normal conversation I might have with a classmate or friend. I learned that when I conduct interviews in the future, I should be careful to give my interviewee enough time to think of answers to questions I ask. My interview subject that night seemed a bit caught off guard and nervous when I asked him questions, and therefore, took a lot of long pauses in between answering. I filled the silence with jabber. I might have gotten even more interesting information than I did if I stopped being terrified of an awkward silence and let him think a little bit more. I also might try to listen to people more when I conduct observations again. I focused a lot on things I could see and ignored most of the other senses, but there were many students around. I might have picked up on some more interesting conversational tidbits if I paid more attention to the conversations happening in the space. Finally, I spent more than two thirds of the observational time with my back to some of the space. To avoid losing sight of half a space, I might try to slightly alter my physical positions in the space throughout my observational period to ensure I’m getting a complete snapshot. Overall, I enjoyed my research practice a great deal. Hopefully, I can use these techniques when I visit some new churches and church services later in the semester!